The life, breath, spirit of the land, will always be in harmony with the people and all living things. Living a healthy and conflict- free life requires effort. We can move ahead by learning to cut our cords to ill- feelings and wrongdoings related to events in our present time as well as those from the past. We can refuse victim consciousness and adopt instead, the consciousness of health, harmony, balance and love. Previous negative experiences need not prevent us from experiencing our inherent goodness. Ho’oponopono is the answer for bringing the balance back into one's life, community, society, the world, and ultimately, the universe. simply reacting from our past traumas. The basic foundation in the pursuit of healing the body, mind or spirit, is to aspire and work toward a conflict-free life. This involves clearing the path of inherent imbalances, unwanted burdens, relationships or problems that have accumulated and have manifested in a life that is not being lived in it's full creative expression. Ho’opono or ho’oponopono has been used effectively for many generations in Hawaii and it is one of the reasons why Hawaiians were able to live in harmony with each other on a small island for so long. The method as presented in this course is the same as what has been used for hundreds of years; however, the language and description has been modified to apply to all people in the present time. · How to disconnect negative energetic cords & connect with positive outcomes. · How to implement na’au pono (intuition) & mana’o pono (will power) when manifesting positive outcomes. · The concept of kanawai (state of being, way of life) and ahupua’a (connected living). · Expectations versus outcomes will be discussed. 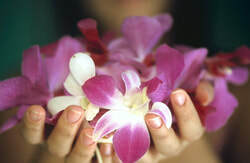 · Learn Hawaiian chants and how to perform your own ceremony. · The “onion” concept: Identifying the core of the problem (negative emotional experience) and eliminating it entirely! · Anticipate a life transforming experience.